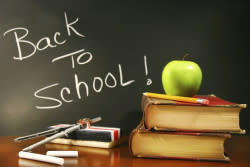 The Chamber’s 16th Annual Back To School Luncheon is set for Thursday, August 10, at 11:45 a.m. at the Seekatz Opera House in downtown New Braunfels. A program of the Business-Education Partnership (BEP) committee, this event takes time out to recognize and honor area Teachers of the Year from 12 schools and school districts in the central Texas area. In an effort to show support for the schools in New Braunfels and Comal County, the BEP created this event as a way to connect business and education thus achieving the goals of the Chamber’s committee. The honorees are selected by their home schools, and then compete at the district level for primary, elementary, and secondary Teacher of the Year. The event is sponsored by area businesses and is limited to 120 attendees, due to space. Since there are sponsors, there is no charge to attend. The honorees are joined by family members, campus and central office administrators and school board members. The BEP committee members are all involved in the planning and program for the day. The teachers are presented with a certificate and yellow rose. Speakers in the past have represented the Texas Education Agency, State Board of Education, State Legislators, and panel discussions involving area superintendents and their board members. This year’s speaker is Command Master Chief Cal Lambert, U.S. Navy (Retired). Mr. Lambert was selected as the 2016 Secondary Teacher of the Year from Uvalde ISD. He is the JROTC Commander at Uvalde High School. This Chamber event showcases the heart and soul of public education – the Teachers! This event is sponsored by Brain Balance Achievement Center, Central Texas Technology Center, First Commercial Bank, Linebarger Goggan Blair & Sampson, LLP, Los Gallos, Miller & Miller Insurance Agency, and Wayland Baptist University.